I recently read a gem of a book titled “How to Create a Recruiting Explosion” by Big Al Tom Schreiter. I found this book while surfing on Amazon a few weeks back and bought it for just one penny plus shipping. Talk about a deal. I read the book in one setting and then re-read it again. I laughed. I had some “ah ha” moments. I was entertained and educated at the same time. To say I liked it would be an understatement. And no I’m not Big Al’s long lost cousin writing this review because I owe him a favor! I’m writing this review because you need to read the book. PERIOD. Order a copy. Buy a few copies for your downline. Have everyone read it and have a training session about what you learn. Yeah, the information is about 30 years old, but it is still very relevant today. Listed below are some of my favorite quotes from the book. Each quote is in bold and italics. After each quote I share my own two cents about it. # 1 Want to guarantee your group’s decline? It’s easy. Just stop working and watch. The speed of the leader is the speed of the team. Your group will watch what you do and if you are lucky, they might do 50% of what you do. If you do nothing, your group will die a quick death. # 2 Recruiting and retailing activities builds business. These are the two most important activities in your business. Spend MOST of your time doing these two things and you will be set. Don’t confuse busy work with being productive. # 3 The best contests have provisions that allow everyone to win. Make sure that your contents are designed for part-timers so everyone has a chance to win. By all means, you can have a grand prize winner, but also have smaller, achievable prizes. This will encourage your part-timers to participate. # 4 Distributors, like ordinary people, are short-term planners. Most people in the real world think short-term. It’s natural for most people. Leaders, on the other hand, tend to think long-term. # 5 If your contests are longer than two weeks, distributors will wait thirteen days before starting. People tend to procrastinate in just about everything they do, especially in this business. # 6 People work better in pairs. Team up your downline members so they have an accountability partner to work with. When you put two people working together they can get a lot accomplished. # 7 We have to build deep to help our distributors taste some success. Light a fire in the basement of your team so everyone gets excited. Build your business from the bottom up. # 8 Professional recruiters spend their time in front of qualified prospects. Amateurs spend their time in front of anyone and everyone. Make sure that you have a way to pre-qualify people BEFORE you show them the plan. This will save you a lot of time. # 9 Understanding builds credibility. Credibility builds trust. People will only join you if they like you, know you and trust you. # 10 It’s almost impossible to help someone who has given up. You can’t drag people across the finish line. Work with the willing, the people who deserve your time. # 11 Prospects put us under a microscope and judge us more than they judge the opportunity. People don’t join companies, they join people! # 12 New distributors need follow-up, patience, and training. They don’t need an absent leader. Nearly 95% of your team will need intensive support, especially during their first 90 days. Be accessible and have a game plan for your new people. # 13 Everyone wants to make an appointment with the expert. An expert is someone from out of town with a briefcase. # 14 Logic doesn’t sell. Emotions and credibility sells. Appeal to people’s emotions whenever possible. # 15 A key to a profitable multilevel business is not getting more distributors, but keeping the present distributors. Recruiting will make you money but retention will make you rich. You should order a copy and read it! 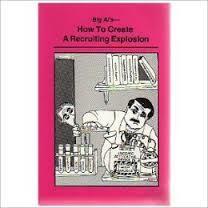 Big Al’s “How to Create a Recruiting Explosion” was published in 1986 by KAAS Publishing. It is an out of print book and comes in paperback format. The ISBN is 1-892366-01-0. It features 119 pages. Big Al is one of the most respected trainers in our industry. He’s been in the industry for more than four decades now. He has tons of wisdom, a great personality, and frequently speaks at different company conventions. In review, I give “How to Create a Recruiting Explosion” 9 out of 10 stars and think you should buy a copy and read it. It’s fun, loaded with great tips and easy to read. Even though the book is nearly 30 years old, it is still relevant in today’s fast paced world. What are your thoughts? Have you read the book? What is your favorite quote on this list and why? Leave a comment below to let me know what you think. I look forward to hearing from you. This book by Big Al sounds like a must read. The quotes fit completely even though it is 30+ years old. That is something that I love about network marketing; even though technology has changed things, the basic principles of network marketing haven’t changed. #10 is one that sets good with me. Sometimes we try to hard to save someone from quitting or going dormant, and what is actually happening is they are bringing us down. Wisdom is knowing when to just step away. All these quotes are great. I just may get this book. Big Al is one of my favorite MLM trainers and reps of all time. I love to read and research, and this definitely seems like a great book to add to the collection. I’ll likely order several copies and use these as giveaways for my team members. I often find the extra incentives helps to motivate them during times of the year (like the holidays) where their focus can easily be elsewhere. Great review. Thanks for the recommendation.